ROANOKE, Va. — Sample some Southern cuisine and warm Virginia hospitality at the Hotel Roanoke, where creamy peanut soup, and Hotel Roanoke Spoonbread are menu favorites. A full yellow moon over the Blue Ridge Mountains makes a typical beautiful evening in Roanoke even better. The town&apos;s recognizable lighted star sparkles at the top of Mill Mountain, where the gregarious mayor, David Bowers, sometimes greets visitors as he walks his dog. Roanoke, situated 240 miles from Washington, D.C., and 40 miles from Blacksburg, site of Virginia Tech, is a gateway to the Blue Ridge Parkway, one of America&apos;s most favored drives. The Blue Ridge Parkway, established in 1936, runs 469 miles, mostly along the famous Blue Ridge, a major mountain chain that is part of the Appalachian Mountains. The parkway is a National Scenic byway and is the most visited site in the United States National Park Service. The “Star City,” is a scenic vacation destination offering old-fashioned Southern hospitality, railroad history, arts and culture, fine dining and family-owned wineries. An array of outdoor activities includes bird watching, hiking, biking, boating and fishing. The scenery is a nature lover&apos;s dream. Look for flowering shrubs and wildflowers in the spring, including rhododendrons and dogwoods, daisies and aster flowers in the summer. Accommodations in the city and outlying areas are available to suit every taste. Choose from campgrounds, cabins and lodges, bed-and-breakfasts, hotels and motels. The stately and historic Hotel Roanoke is a popular choice for visitors who appreciate first class accommodations in the heart of the city. The Tudor-style hotel was built in 1882, to shelter and sustain thousands of workers who flocked to the area to share in the prosperity of the Norfolk and Western Railroad, a combination of the Atlantic, Mississippi & Ohio Railroad with the Shenandoah Valley Railroad. Since those early days the hotel has reveled in glory days, and survived the hard times. Through the years it has served as a gathering place for locals and visitors from throughout the world. 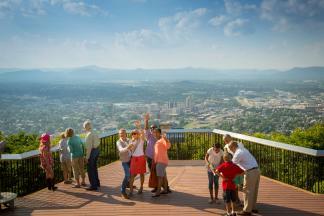 Roanoke is a family destination with many choices for entertainment and relaxation. Find a great place to stay, and explore the town, and set out on mountain adventures. The Roanoker Restaurant is a warm friendly place to begin the day. The staff will treat you like a local, and that&apos;s good. The restaurant&apos;s light and fluffy biscuits are featured in the newest Southern Living recipe book, “Off the Eaten Path.” The longtime restaurant is listed in the top five places to eat breakfast in Virginia. The kitchen turns out 1,500 to 2,000 of their top-notch biscuits every day. Board the last two steam locomotives that still exist at The Virginia Museum of Transportation. The massive Class A 1218, known as the “Mercedes of Steam,” and the sleek Class J611, considered the most advanced passenger steam engine ever built, are on display at the museum. The Historic Market District is open year round in downtown Roanoke, where local farmers and growers display their bounty as well as crafts. Prices are fair, and quality is high. Museums, galleries, out of the ordinary shops and restaurants contribute to a lively and interesting Downtown Roanoke experience. Enjoy the Blue Ridge Mountain views at Chateau Morrisette, a family owned winery with a dog theme. When visitors purchase a kennel pack it&apos;s not a case of dog bones. The owner, Dave Morrisette, names his wines after dogs. The first was a red wine called The Black Dog, the second, a white wine named, Our Dog Blue. 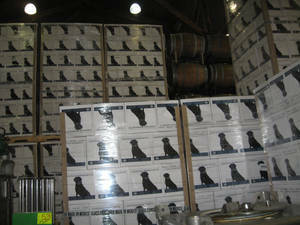 There are many other popular and successful Morrisette wines with dog labels. A percentage of sales helps support service dog organizations, and medical research benefiting dogs. The restaurant at Chateau Morrisette offers high quality dining in a casual atmosphere with a view of Buffalo Mountain. It&apos;s a place to slow down and enjoy the beauty. Just one visit to Roanoke and the surrounding Blue Ridge Mountains makes the saying, “it&apos;s a Blue Ridge day,” perfectly clear. Travel and accommodations provided by Roanoke Valley Convention & Visitors Bureau.